By popular backing on my Instagram account, here is my Pumpkin Pie Recipe. Now, I do realise that it may not be pumpkin season everywhere, but there are plenty of them kicking around in Taiwan. But, I found myself browsing around on Village Bakery and just had a need to bake. Fortunately, I had a pumpkin lying around (as you do), so here we go. 1 peeled, deseeded and roughly chopped pumpkin (The smaller the chunks, the faster the flesh will cook, bear that in mind). Use around 700g of pumpkin for this, make sure you weigh it after you’ve prepared it – you’d be surprised how heavy the skin and the seeds can be. OK, so we need to get that oven on, and the pastry in the oven. Turn your oven to 180celsius, and get your pie case mould out. I used a tart tin that has a push-out bottom, and is 22cm. Take your pre-made sweetened pastry (sorry, I am terrible at making pastry, so I always buy pre-made), roll it out until it’s a bit bigger than your tin, flop it over the top of the tin, and then push the pastry into the bottom and the sides of your tart tin. You don’t want the pastry to be too thick, but at the same time, you don’t want it too thin, either. Now, to bake the pie casing. Press some baking parchment into the pie casing and either fill with baking beads (fancy), or rice (wasteful, but a cheap substitute, especially in Taiwan). Bake the pie casing for around 15mins, or until it gets a slight colour and goes a little crispy. Take it out of the oven, leave to cool, and turn the oven up to 200celsius, this time. While the pie is baking, we need to cook the pumpkin. Fill a pan with water, bring to the boil, drop your pumpkin chunks in and cook until they’re nice and soft. Drain the water off, mash them up, and push through a fine sieve. Mix all other ingredients into the pumpkin, now, and use a whisk to make sure everything is mixed in perfectly. At this point, we want to put the pumpkin mix onto the heat for around 5 mins on a high heat, so it thickens up and warms up nicely before we put it into the warm pie casing. 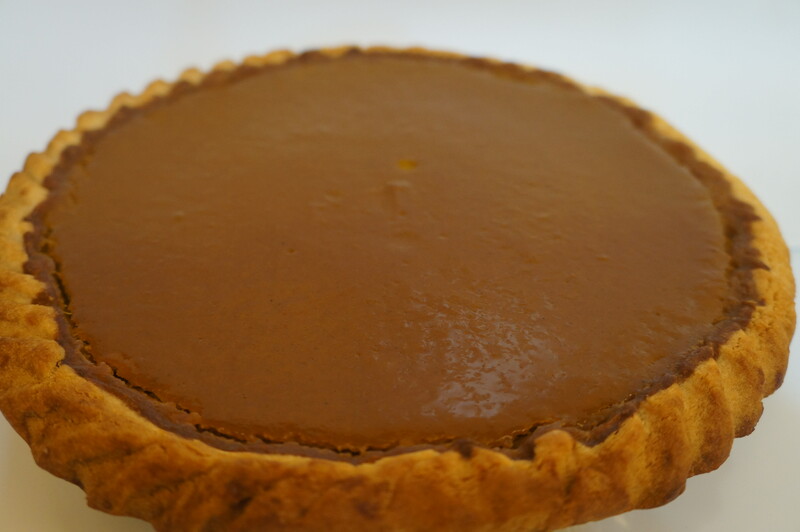 Now that’s all done, pour the pumpkin mix into the pie casing, and bake for around 40mins. When it’s finished cooking, leave it to cool, then put it in the fridge for as long as possible (before you can’t resist anymore). You want the middle to be firm enough to hold up when you cut it, and if it’s warm, it won’t hold up. Let me know what you think, tag me in your pics, and check out Village Bakery for more inspiration!